Top ranked Al Riyadi (9-3) recorded its third loss at the home court on Friday night. Hosts were defeated by fourth ranked Beirut Club (7-4) 80-75. Beirut Club outrebounded Al Riyadi 54-41 including 17 on the offensive glass. They looked well-organized offensively handing out 21 assists. The former international power forward Charles Tabet (205-87, college: S.Alabama) fired a double-double by scoring 13 points and 18 rebounds (on 6-of-7 shooting from the field) for the winners. 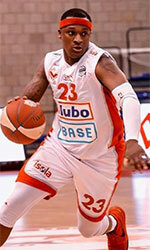 American guard Quincy Douby (190-84, college: Rutgers) chipped in 26 points and 4 assists. Naturalized Egyptian power forward Ahmad Ismail (205-76) produced 23 points and 6 rebounds for lost side. Beirut Club have a solid series of three victories in a row. They maintain fourth place with 7-4 record. Al Riyadi at the other side dropped to the third position with three games lost. Beirut Club are looking forward to face Byblos (#6) at home in the next round. Al Riyadi will have a break next round. Another exciting game was a derby match between two teams from Beirut: Homentmen (#3) and Hoops Club (#5). Hoops Club was crushed at home by 16 points 71-87 and even the advantage of their own court did not help. Worth to mention a great performance of U.S. Virgin Islands-Puerto Rican point guard Walter Hodge (183-86, college: Florida) who helped to win the game recording a double-double by scoring 21 points, 9 rebounds and 10 assists. Michael Efevberha contributed with 28 points for the winners. Senegalese forward Ibrahima Thomas (213-87, college: Cincinnati) answered with a double-double by scoring 23 points and 13 rebounds for Hoops Club. Both coaches used bench players which allowed the starters a little rest for the next games. Homentmen have a solid series of three victories in a row. Defending champion (9-2) moved-up to second place. Newly promoted Hoops Club keeps the fifth position with seven games lost. Homentmen will play against Al Moutahed (#7) in Tripoli in the next round which should be theoretically an easy game. Hoops Club will play on the road against the league's leader Champville in Dik El Mehdi and hopes to get back on the winning track. The game in Byblos was also quite interesting. Second ranked Champville (10-2) played at the court of 5th ranked Byblos (4-8). Champville managed to secure a 4-point victory 83-79 on Sunday. Fadi El-Khatib stepped up and scored 33 points (!!!) and 7 rebounds for the winners. At the losing side Malcolm Riley responded with a double-double by scoring 25 points, 10 rebounds and 4 assists (made all of his seven free throws). Champville have an impressive series of seven victories in a row. They keep a position of league leader. Byblos lost fourth consecutive game. They dropped to the sixth place with eight games lost. Champville will meet at home Hoops Club (#5) in the next round. Byblos will play against Beirut Club and it may be a tough game between close rivals. In the last game of round 13 Atlas F. defeated Moutahed in Zahle 84-74. Another exciting game was a derby match between two teams from Beirut: Homentmen (#3) and Hoops Club (#5). Hoops Club was crushed at home by 16 points 71-87 and even the advantage of their own court did not help. Homentmen forced 21 Hoops Club turnovers. Worth to mention a great performance of U.S. Virgin Islands-Puerto Rican point guard Walter Hodge (183-86, college: Florida) who helped to win the game recording a double-double by scoring 21 points, 9 rebounds and 10 assists. Nigerian-American guard Michael Efevberha (193-84, college: CS Northridge, agency: Octagon Europe) contributed with 28 points for the winners. Senegalese forward Ibrahima Thomas (213-87, college: Cincinnati) answered with a double-double by scoring 23 points and 13 rebounds and American point guard Willie Warren (193-89, college: Oklahoma) added 18 points and 6 assists in the effort for Hoops Club. Both coaches used bench players which allowed the starters a little rest for the next games. Homentmen have a solid series of three victories in a row. Defending champion (9-2) moved-up to second place. Newly promoted Hoops Club keeps the fifth position with seven games lost. Homentmen will play against Al Moutahed (#7) in Tripoli in the next round which should be theoretically an easy game. Hoops Club will play on the road against the league's leader Champville in Dik El Mehdi and hopes to get back on the winning track. Top ranked Al Riyadi (9-3) recorded its third loss at the home court on Friday night. Hosts were defeated by fourth ranked Beirut Club (7-4) 80-75. Beirut Club outrebounded Al Riyadi 54-41 including 17 on the offensive glass. They looked well-organized offensively handing out 21 assists. The former international power forward Charles Tabet (205-87, college: S.Alabama) fired a double-double by scoring 13 points and 18 rebounds (on 6-of-7 shooting from the field) for the winners. American guard Quincy Douby (190-84, college: Rutgers) chipped in 26 points and 4 assists. Naturalized Egyptian power forward Ahmad Ismail (205-76) produced 23 points and 6 rebounds and American guard Mark Lyons (185-89, college: Arizona, agency: Higher Vision Sports) added 21 points respectively for lost side. Beirut Club have a solid series of three victories in a row. They maintain fourth place with 7-4 record. Al Riyadi at the other side dropped to the third position with three games lost. Beirut Club are looking forward to face Byblos (#6) at home in the next round. Al Riyadi will have a break next round. We cannot really consider it an upset in the game between close teams in Tripoli where 7th ranked Al Moutahed (3-7) was defeated by eighth ranked Atlas F. (3-8) 84-74 on Saturday. Great defensive blocking was one of the keys in this match when Atlas F. made 8 blocks. American guard Ghassan Nehme (190, college: Fair Dickinson) stepped up and scored 33 points (!!!) 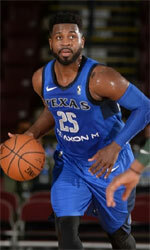 and 5 rebounds for the winners and his fellow American import power forward Darian Townes (208-84, college: Arkansas) chipped in 16 points, 10 rebounds and 6 blocks. At the losing side American point guard Marvelle Harris (196-93, college: Fresno St., agency: Slash Sports) responded with 36 points (!!!) and point guard Hassan Dandach (187-91) scored 10 points, 5 rebounds and 4 assists. Newly promoted Atlas F. maintains eighth place with 3-8 record. Al Moutahed lost fourth consecutive game. They keep the seventh position with seven games lost. Atlas F. will meet at home bottom-ranked Sagesse (#9) in the next round. Al Moutahed will play against the league's second-placed Homentmen having rather not much hope for a victory. The game in Byblos was also quite interesting. Second ranked Champville (10-2) played at the court of 5th ranked Byblos (4-8). Champville managed to secure a 4-point victory 83-79 on Sunday. Champville made 19-of-22 free shots (86.4 percent) during the game. They also forced 19 Byblos turnovers and had a 23-9 advantage in offensive rebounds. Champville looked well-organized offensively handing out 21 assists. The former international forward Fadi El-Khatib (198-79) stepped up and scored 33 points (!!!) and 7 rebounds for the winners and international center Ater Majok (208-87, college: Connecticut) chipped in 17 points and 8 rebounds (on 8-of-10 shooting from the field). At the losing side American forward Malcolm Riley (196-93, college: Texas Southern) responded with a double-double by scoring 25 points, 10 rebounds and 4 assists (made all of his seven free throws) and the other American import forward Aaron Nelson (205-91, college: S.Indiana) scored 20 points and 6 rebounds. Champville have an impressive series of seven victories in a row. They keep a position of league leader. Byblos lost fourth consecutive game. They dropped to the sixth place with eight games lost. Champville will meet at home Hoops Club (#5) in the next round. Byblos will play against Beirut Club and it may be a tough game between close rivals.